Stephen Toone of Fordingbridge shares insights into how to build client relationships through collaboration, giving the example of several projects at East Surrey Hospital. It is vital for designers and suppliers to remember that when collaborating with the NHS, there are certain key aspects to consider which create a successful working relationship. 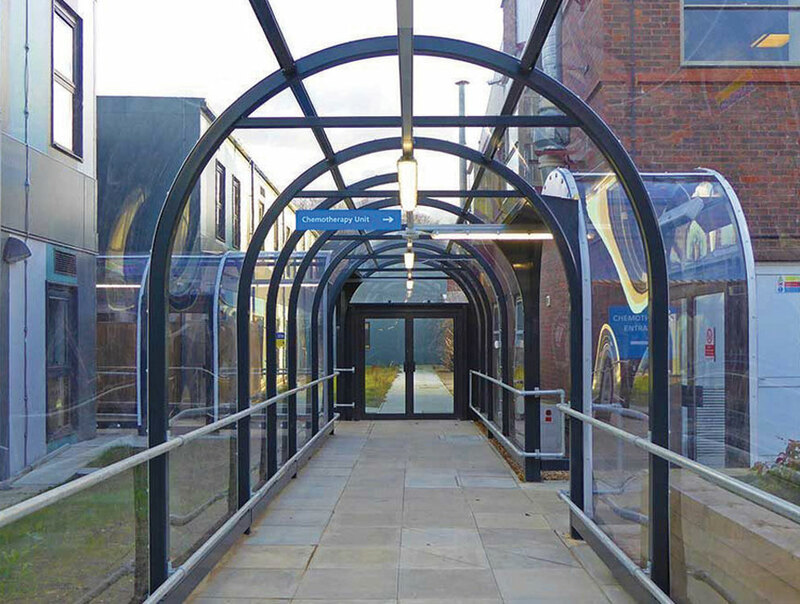 An example of successful collaboration between ourselves – as a canopy and building contractor – and East Surrey Hospital started following the NHS trust’s decision to redesign and build the hospital’s east entrance following fire damage. 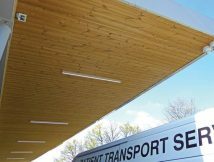 We were commissioned to install a 270m² canopy to improve vehicle flow and protect patients arriving by ambulance, or being dropped off by car, from the elements. The specified solution was a 3.9m cantilevered canopy with a 3.7m height, giving the ideal clearance for ambulances as well as shelter from the elements for patients. The 30m long structure follows the building line and is stepped in plan to accommodate an existing roof overhang. To provide continuous rain protection, the polycarbonate roof tucks neatly under the new A&E building extension constructed at the same time as the canopy. The success of the project led to the firm being invited to tender for more work on the site. 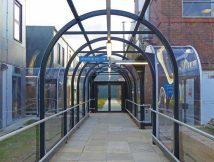 We provided a 45m covered walkway to provide a weather-protected journey between wards for staff and patients. This involved collaborating with the design team to find the best solution. There were a number of design requirements; it had to be wide enough to allow two patient beds to be able to pass easily, and the height and roof shape needed to allow lighting and heating systems to be incorporated. A gap at the base of the canopy provides ventilation and two sets of double doors allow access to wards around the courtyard. The courtyard location necessitated easy-to-construct structure sizes. Another area, which was required to be improved was the entrance to the A&E department. A canopy was designed and installed to accommodate a generous unloading space for nine ambulances. The devil was in the detail again – constraints including clearance requirements, roof overhangs and the need to fit into a forthcoming extension to the emergency department. The 27m x 10.7m steel canopy covered the entirety of the entrance. The height of the canopy allows ambulances to arrive and unload patients completely protected by the 4.3m front cantilever. Without a canopy, transferring patients on an uncovered pavement leaves users at risk of getting wet and cold. Timber cladding was used on the soffit to bring a modern aesthetic and warmth to the structure. Fordingbridge collaborated closely on the canopy design with the trust’s lighting designer and groundworker, resulting in a cohesive result. The canopy was installed in three weeks, which involved careful planning to avoid disruption to a live site in use 24/7 including coordination with other contractors. Fordingbridge recognised that the client’s primary objective at East Surrey Hospital was to improve patient care by providing more space and protecting patients, staff and visitors from adverse weather, while enabling new patient strategies to be delivered. The first step in successful collaboration is to understand and work with client objectives. All areas of the hospital needed to remain operational throughout construction, meaning that safety was paramount to the build process. The construction team project managed elements to fall outside of the busiest periods. This makes the client’s lives easier in terms of minimum disruption to their service. Incorporating all other trades in the design stage to ensure key stages in the project run smoothly and according to timescales. Having the communication skills and industry knowledge to collaborate are also key in achieving this. When delivering a quote, design teams need to ensure that the final cost really is the final figure, no hidden costs or surprises. This allows the client to budget easily and builds the trust between the client and contractor. Designing with attention to the CDM regulations and future maintenance liabilities in mind this shows the client you are not just looking to make a quick buck. Showing that you care about the future proofing of the structure and the longevity of it is proof in the pudding. Giving guarantees not only demonstrates faith in your product, it gives the client peace of mind. 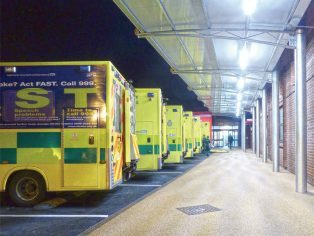 Trust is enhanced, as evidenced by our subsequent contracts at East Surrey Hospital, including the new extension to the A&E. When working with the NHS in particular, it is vital that members of the supply chain work to build a relationship of trust. Proving that firms can collaborate successfully with both the client and other contractors, this will stand them in good stead for future projects.